Incredible deals on the brand new Surface Laptop 2 and Surface Pro 6. 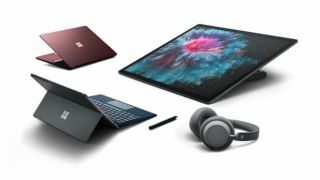 Just a month ago, Microsoft launched two new devices: the Surface Pro 6 and Surface Laptop 2. While we were anticipating plenty of Black Friday Microsoft deals, we weren't expecting bargains on these products, brand spanking new as they are. But we were wrong. In its early Black Friday sale, AO has knocked £200 off several Surface Pro 6 and Surface Laptop 2 models – scroll down to see the offers. These deals went live this morning and are scheduled to run until 4 December. But if you want one, snap it up now, because we suspect stocks won't last forever. Also take a look at our roundup of all the best Black Friday deals for creatives for more top bargains as they're announced. Our sister site TechRadar awarded the Surface Pro 2 four and a half stars in its review, saying it offers "a pure, powerful Windows 10 experience" (read the full review). The Surface Pro 6 also impressed, gaining four stars and the title "the best Windows tablet money can buy" (read the full review). Most of the models is this promotion have a blanket £200 off, which means you're getting a bigger percentage saving on models with less storage (you'll save 14% on a 256GB Surface Pro 6, but only 9% on the 1TB version, for example). But make sure you figure out the storage you need to meet your needs – it's not a bargain if it doesn't fit your workflow. Save £180: If you don't need masses of storage on your laptop, the 128GB version of the Microsoft Surface Laptop 2 offers the biggest percentage discount of this promotion (18%). Save £200: Pick up a Surface Laptop 2 with 256GB of storage with £200 off. This is the platinum version, but the same discount applies to the burgundy and cobalt blue versions. Save £200: For plenty of storage and super-fast loading, the pricey 513BG Surface Laptop 2 is a little cheaper with this discount. Again, you can choose between for platinum, burgundy or cobalt blue. Save £200: This model of this 2-in-1 laptop has the least storage in the range (256GB) but the biggest percentage saving (14%). Pick one up in this early Black Friday deal for £1229. Save £200: Sitting in the middle of the range when it comes to storage with a 512GB SSD, this 2-in-1 laptop has been knocked down by £200 in this promotion. With a hefty 1TB storage, this silver Surface Pro 6 from AO will be able to deal with even the most demanding tasks. £200 off still puts this supercharged machine at almost £2k though. Also in the AO deal is Microsoft's Surface Book 2 13.5". While this model is older, it's still extremely powerful and definitely worth a look. It was awarded a near-perfect four and a half stars in TechRadar's review, which singled out its "premium design [and] excellent features". £200 off: Pick up 13.5" Surface Book 2 with 10% off in this early Black Friday deal. £200 off makes this pricey model a little easier on the wallet.